Everyone has heard of Kobe Beef, the most famous beef in the world, but it's just one of many wagyu brands in Japan. 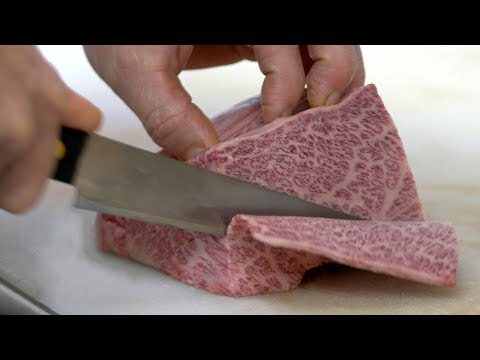 In fact Japan has over 300 brands of beef, all with that amazing marbling and leanness you'd expect from premium graded A5 beef. Every 5 years, Japan holds the Wagyu Olympics and Tottori Wagyu won the "best beef" competition this year. Could Tottori prefecture have the new no.1 wagyu steaks - even better than Kobe or Matsuzaka!" On a mission to find out, I traveled across Japan to Tottori Prefecture and the Mt. Daisen area near Yonago city to see if and what makes their beef so very tasty. Mt. Daisen is called the Mt. Fuji of the west - and it looks it! It has a history long history as a wagyu marketplace and the fertile grass and clean water and air lead to a great environment for the cattle. Ranch owners also make sure wagyu live stress free lives and care for them like children. They're very proud of the wagyu cattle. But how do you love an animal like family - then eat it"